Human skin is an amazing organ. It is the largest organ of the body and your skin also projects your individual identity and persona to the world. Why must each building be straight or vertical? With today’s tensile material and progressive designs, you can easily wrap or fold the facade to create an innovative look rather than the tired old shoebox-on-end many people live and work in. Filtering or second skins add a special flavour to the look of a building but also provide strong environmental benefits. For example, Aedas created a secondary sunscreen for a couple of towers in Abu Dhabi that deflect a portion of the sun’s glare. Art and lighting can be implemented individually or in combination with a second skin to provide cultural definition to both your building and the surrounding neighbourhood. 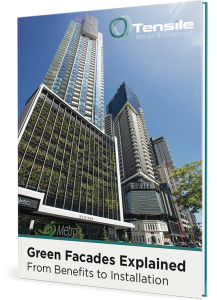 Green facades have become increasingly popular for today’s modern buildings. They provide excellent insulation and bring down the number of pollutants such as carbon dioxide and dust. Tensile facades give you the opportunity to use colour in innovative ways. You can create mosaics with different coloured meshes, add printed graphics to reflect the culture of the city or add branding for a business or organization. Movement: Why Must Facades Be Static? Today’s tensile membrane structures are light and flexible enough to move and adapt depending on the goals of the design. Architects today have more options available to them than in the past, which means facades do not and need to remain static. Operable facades can add light and provide better airflow. Considering the above options, why just use one at a time? When you are able to open your mind to the possibilities available today, you’ll see that few people would choose only one tensile facade element we’ve outlined here. The possibilities are endless: paper, polyester, acrylic and tensile structure textile membranes are all available to the architect. Today, you have many options to create a building unlike any other. Tensile facades are like different paints in your palette, helping you conceptualize and create a building like a piece of art that will stand the test of time. Contact us today if you need some help with your next design. Do Green Walls Automatically Mean Your Building Is Green?